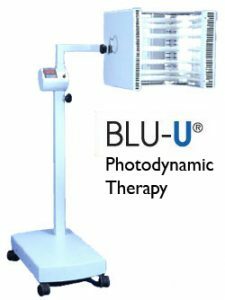 In our office, we use the Blu-U light therapy to treat actinic keratoses (pre cancerous skin lesions), Seborrheic keratosis, as well destroy pre cancerous/pre malignant skin cells often seen in sun-damaged skin on the face, scalp, chest, hands arms and legs. This procedure is non-invasive effective, and well tolerated, with treatments taking approximately 90 minutes. The Blu-U light also treats acne by killing acne causing bacteria, overactive oil glands. Can Levulan Photodynamic Therapy be used for skin rejuvenation, precancerous sun spots, improvement of sun damage and skin cancer prevention? Yes. 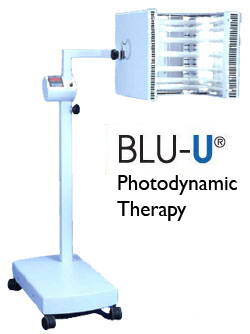 Levulan Photodynamic Therapy using Blue Light can be used for non-surgical skin rejuvenation. This procedure results in significant improvement in precancerous conditions such as actinic keratoses, sun damaged skin and potentially superficial skin cancers. Additionally it potentially prevents the development of skin cancer. Levulan is revolutionizing how we treat sun-damaged skin. Levulan is preferentially absorbed by precancerous cells. When combined with Blue light the Levulan kills the cells, and leaves the normal skin unharmed. It has the added benefit of skin cancer prevention – killing abnormal cells BEFORE they can become a skin cancer. What else can Levulan Photodynamic Therapy be used for? The Blu-U treatment is very safe. The blue-violet light penetrates just deep enough into the tissue to reach the target. It contains no ionizing radiation. Even though there is no evidence of complications, we will not perform this treatment if you are pregnant or breastfeeding. The face should be cleansed with soap and water and free of any oil. Ladies need to be make-up free during the treatment. Please refrain from applying makeup after treatment. The treated area might “crust”, “flake”, or look like a “cat scratch.” Some crusting and scabbing is considered a good result. This should resolve within 3-14 days. Keep the treated area out of the sun and bright lights for 48 hours. Exposure to the sun within this time period can lead to a severe blistering burn in the areas that were treated. If outdoor exposure sun is unavoidable, wear a hat with a brim, cover your face with a scarf, wear large sunglasses and use sunscreen. Sunscreen alone is NOT ENOUGH PROTECTION to prevent a burn in the first 48 hours after treatment. Avoid excessive heat exposure such as saunas, steam rooms, hot showers or baths, and strenuous exercising for 24 hours. This prevents the risk of blistering. You can return to normal activities immediately after treatment, as long as you avoid bright light and sunlight for 48 hours. Specific instructions regarding cleansers, moisturizers and sunscreen use will be provided to you on the day of your treatment. What should a person do if they get significant redness, swelling, or pain after a treatment? Avoid the sun or bright lights as much as possible. Call the office where you had your treatment. They should be happy to help you and to answer your questions. If you are concerned that you have had an abnormal reaction, have a cold sore, or an infection – call your doctor’s office immediately.